Click on the link for the PNA hymn via a YouTube video. Like love and faith our hope grows and blossoms (1 Corinthians 13:13). One of the ways we can nurture hope in our lives is through thankfulness. Identifying the simplest things in our lives and thanking our Father God for them fosters hope, even when we are buried beneath the trials of life. This is also true for our patients struggling with illnesses and diseases. When we struggle to find something to be thankful for, we can pause and thank the Creator for our existence and the necessities of air and water for life. No matter what our situation or our patient’s circumstances there is always something to be thankful for. An excellent passage for thankfulness is Psalm 136. Famous for its repetitive refrain “his steadfast love endures forever” or “his loving kindness endures forever,” the psalm states “Give thanks to the Lord for…he is good…God of gods…does great wonders, etc. The psalm continues with a history lesson of the Israelite s relationship with God. This is our Lord, who has and continues to write a historical narrative in our lives. We discover the sustained hope when we remember how the Lord has worked in our past (Lam 3:21). Take time this week and read Psalm 136 and “Give thanks to the Lord for __________________ filling in the blank with how the Lord has demonstrated his “steadfast love” in recently in your life. p.s. 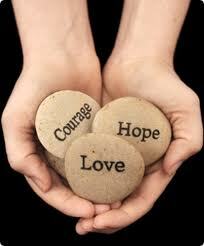 Want to discover how to encourage hope for your patients? Check out three articles from the Journal of Christian Nursing. Importance of Hope; When Hope is Lost Part 1 & Part 2.
became involved with NCFI in 2010 was the hunger for professional Christian resources from international nurses. When I came home from my first trip to Manila, I began praying and talking with Kathy Schoonover-Shoffner, the editor of Journal of Christian Nursing. As time went by and Kathy shared all the “complications” of international journals, costs, currency rates, NCF-USA staff needs, etc, etc, the needs seemed endless. We trudged forward and added the specifics to our prayers and continued to elicit more prayer warriors: Jane Hall (NCF USA president), Barbara, Tove, Amy, and many unnamed saints in OUR passionate petition to bring this wonderful journal to YOU! Well the Lord has seen fit to answer our prayers for the Journal of Christian Nursing is available ONLINE–INTERNATIONALLY! 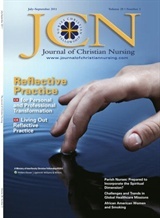 “Journal of Christian Nursing” (JCN) is a peer-reviewed, quarterly, professional journal helping nurses integrate issues of faith with nursing practice and sustain excellence in nursing care since 1984. Our mission is to help nurses, students, and educators practice from a biblically-based, Christian perspective. JCN offers relevant peer-reviewed clinical and professional information, including original research, on: current issues and trends, spirituality and spiritual care, ethics, values, healing and wholeness, faith community nursing, healthcare missions, nursing education, personal growth and self-care, health care for the poor and disenfranchised, and nursing care experiences which promote excellence and encourage nurses. Our Faithful Journey in Nursing: A teaching on Faith, Compassion, Prayer and Excellence in Christian Nursing is available as an eBook at Amazon/Kindle for $1.99 USD. Also available via international markets. This book truly has a God story! It started as a 4 articles with bible studies published in a Norwegian nursing journal…then compiled into one book with globish revisions…distributed by Tove to Sierra Leone nurses. Now published as an eBook…and now distributing hard copies to Denmark for nursing/medical students. Don’t you love it when God is amazing! the unknown and sudden tragedies that await us like a trap for a rabbit. Century, an epidemic is still one of our greatest threats to human health. world, we have a secured eternal place with him. encourage you to memorize it with me. If you were recently at the NCFI international conference in Chile or a regional/national conference, you probably connected with nurses from another country or region. During these conferences we not only enjoy beautiful scenes, explore new cultures, and gain nursing knowledge; we also open our eyes and hearts to our brothers and sisters in Christ. Our connection with nurses outside our area helps us see how nursing is different, yet the same around the world. We may have different jobs in nursing, yet we share the bond of caring for patients. We learn of the various hardships in nursing. Some nurses lack supplies, some lack enough nurses, while others lack money. We also share our personal struggles with one another. Some nurses face persecution for their Christian faith. While others may be experiencing health and/or family concerns. In fact, global fellowship is one of the many exciting things about NCFI. For through our connection with a large multi-member international organization, we can build relationships founded on Christ. Take time this month to pray for each region. “Be on alert with all perseverance and petition for all saints” (Ephesians 6:18). Praise God for his work across the globe in nursing and lift up those who experience hardships. A boat is traveling across the sea when the wind and waves begin to knock the boat around. Most of the people on the boat are fearful as the waves bring water into the boat. Yet, one passenger is asleep on a soft cushion below the deck of the boat. The storm continues and the boat begins to fill with water. All the passengers are in a panic except for sleeping passenger (Mark 4:35-41). Our nursing boat is often rocked by a storm. The storm can be a change in funding, challenges to patient care, or not enough staff. We can quickly feel overwhelmed by the winds of change and the rising water of uncertainty. In fact, nursing and health care are always experiencing some type of storm. Just as Jesus rested in confidence on the storm-rocked boat, we can rest in him. Jesus cares about health care, nursing, and our patients. He will continue to guide us and provide for you, me and our patients. So, when we find ourselves in a health care storm, can rest in faith and God’s promise is to provide.